Two-year-old Mackenzie and four kid goats stay still long enough for mother/farmer/soapmaker Kimberly Christensen to take a photo. 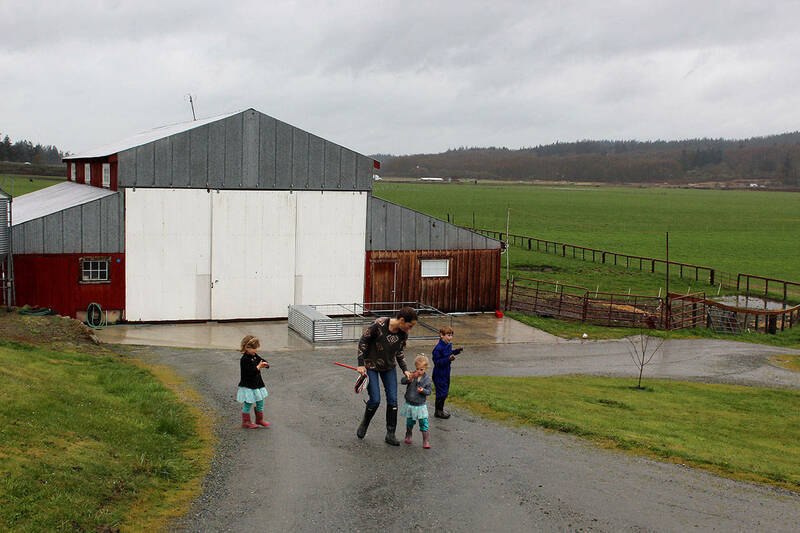 North Whidbey Farm is offering a farm tour April 15-16. So many goats, so many bars of soap. After five years in the business of raising goats and creating an ever-expanding selection of goat-milk products, North Whidbey Farm is inviting the public in to learn about its operation. Tickets are $6 for children, $12 adults and $30 for families. Adults and families also receive bars of soap with admission. Samples of goat milk cajeta (caramel sauce) may be served at tour’s end; it’s one of many edible products made by Brian Christensen. He also creates chevre, yogurt and kefir crunch, a probiotic supplement for pets. All are certified organic by the U.S.Department of Agriculture. Visitors will see where the goats live, the milking parlor, the milk chilling room and where the little goats romp and hop around. The tour takes about an hour; people are encouraged to pick a time slot online. “We’ll let people come into the pens, cuddle the baby goats. They’re usually very sweet,” she said. Sweet but they like to eat. Every and anything seems fair goat game. Coat, shoe laces, pants, hair, reporter’s notebook, camera. The Christensens also have three other children, MacKenzie, 2, Paige, 4 and Flynn, 10 months. The 300-acre farm in north Oak Harbor was started in the 1930s by Brian’s great-grandparents, Henning and Dorothy Christensen. It’s owned by Ron and Sue Christensen, Brian’s parents. Brian and Kim started out with a herd of Oberhasli goats, a Swiss breed that is rust colored with black stripes on the face. They then added the smaller, docile Guernseys. Many of her customers say the soap helps their sensitive skin. Others rave about its “creamy feel” and “dreamy scents.” Each bar has at least one ounce of goat milk, along with olive oil, coconut oil and palm oil that nourish and moisturize skin. Kim’s parents, Herman and Marjorie Dontje, also help with all kinds of kids as well as the business for about eight months of the year. Make that 36, 37, 38. “Look, I think three more were born yesterday,” Kim Christensen tells her daughters as they check on the adorable four-legged kids. Little light brown furry creatures with long legs and tiny faces started appearing four weeks ago. White spots adorn some, others are darker in color. The farm breeds once a year. Soap central is in the couple’s basement, possibly the best-smelling cellar around. Big blocks of different-colored soap line one table — light green, beige with oatmeal flakes, violet, pale yellow. The array of scents include lemongrass, grapefruit, coffee, palmarosa orange, minty lavender, patchouli and mint, star anise, tea tree. “All the ingredients come from the earth in one form or another,” Kim who is a Coupeville Farmers Market vendor. After the bars are sliced into even squares, they dry on metal racks in a smaller room. It’s also where Kim’s mother labels and packages all the soap, lotion, body butter and other products. Marjorie Dontje swears by the arnica muscle rub salve her daughter makes with five ingredients. She said it’s done wonders for her hands that were becoming increasingly stiff and sore from labeling. Although her hair is pure white and she looks the part of “grandmum,” her grip speaks otherwise. • North Whidbey Farm Tour 2018: April 15 and 16, 231 E. Frostad Road, Oak Harbor. Adults $12, children $6, family, $30. Includes bars of soap. A sample of the soap made from goats milk and a variety of flowers, herbs and plants at North Whidbey Farm. Products are sold at the Coupeville Farmers Market and online. Paige Christensen, 4, cuddles a baby goat while her little sister Mackenzie checks on three born the day before. North Whidbey Farm products from goats milk, include soaps, lotions and some unique food. The 300-acre farm has been in the Christensen family since 1935. For the past five years, Brian and Kimberly Christensen have raised goats and created many products from goats milk.